Hope your week is going great! 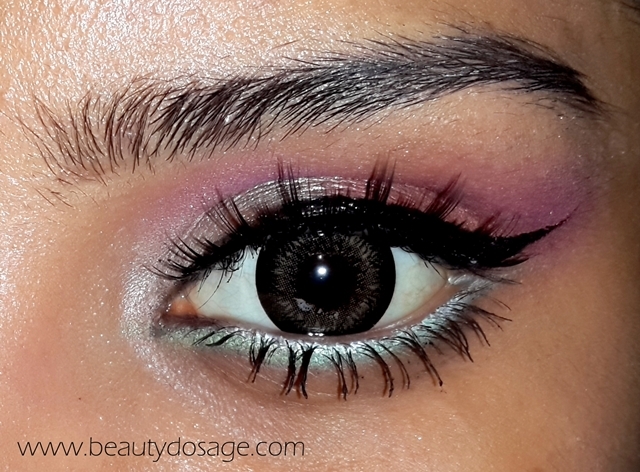 It’s been pretty gloomy past few days where I live so liven things up here is a bright eye makeup look with a pop of mint in the lower lash line. Before I get started hope you have all joined me giveaway HERE, where you can win NARS, OPI, NYX etc! You have an option between two wonderful prize packs worth of $60 each. Let’s get started with the tutorial! Start with priming your lids as usual. I have used Elf eyelid primer here. 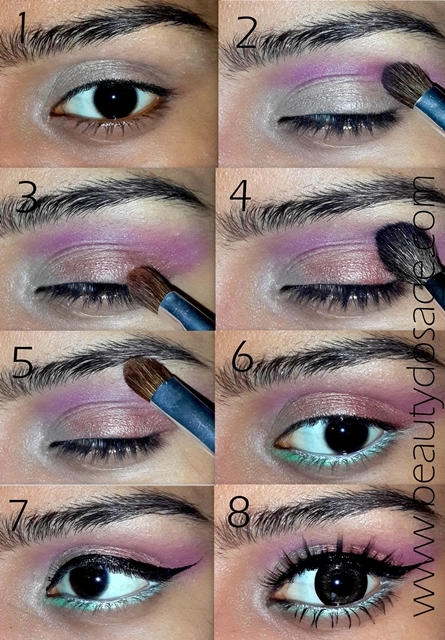 Using a champagne shade in the inner corners of the eyes and the inner half of the lid. To give a gradient of shade, I have used a magenta shade on the crease with a stiff blending brush you can use any bright shade for this. Using a burnt orange shade, I have placed it on the outer half of the lid and blended it towards the champagne shade I applied previously. This is to blend the outer V and also make the shades transition rather than making it a cut crease look. To lend all the shades and the harsh edges in the crease, I’m using a fluffy blending brush. Highlight the brow bone with a pearl finish champagne shade. Line your lower lash line with a bright eye liner or simply wet your eye shadow brush and line your lashline with it. Line your upper lash line with a rich black liquid line and wing it, i have drawn a dramatic wing but you can draw a thin one too. Finish off the look with mascara and falsies. I have tried to clump my lower lash line purposely to give a doll like effect to the eyes and as for lashes I have used ones that look spiky. I have also used circle lenses here which i will review soon! Hope you have fun recreating this look and until next time, take care! wow.. so very beautiful!! Incredible! !